When Gautam Malkani’s book hit the shelves in 2006 the timing couldn’t have been better – or possibly worse since the same year saw the publication of a book called Londonistan by Melanie Phillips which examined the rise of Muslim fundamentalism in London. You really would get a shock if you went out to buy one and got the other – the two topics couldn’t be more different. Londonistan is described by Wikipedia as “A pejorative sobriquet referring to the British capital of London” – for those not familiar with the term, ‘pejorative sobriquet’ is just swanky-speak for ‘nasty name’. By contrast Londonstani is a term of pride to indicate young British Asians in the London area encompassing all the sub-continent’s many and different religions. 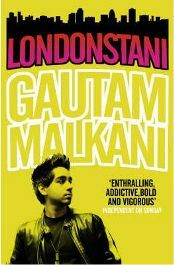 However the Londonistan/Londonstani controversy meant that Malkani’s book was sure to get a lot of attention even though it had nothing to do with terrorism. So if it’s NOT about terrorism, what is it about? Well in short, it’s another in a long line of books about one of literature’s favourite topics; teenage angst and the problems of ‘fitting in’, making friends and finding your place in a changing society. Oh and of course there’s a ‘boy meets girl – boy loses girl’ line running through as well. It’s just this one’s a bit different because it’s set in the multi-cultural environs of Hounslow – an area highly dependent on Heathrow airport and rather more ‘middle-class’ than the protagonists of this story would ever want to admit. This book sat on my shelf for a long time but once I got started, I was soon hooked. On page one I was horrified and ready to put it to one side, appalled by the violence, racism and intensely irritating language and seeing it as a 21st Century Clockwork Orange. Thirty to forty pages later I was starting to get to know the protagonist and growing more interested – seeing parallels with books like Catcher in the Rye and the Outsider and forcing myself to go beyond the annoying writing style. Halfway through I was gunning for the ‘hero’ to succeed in his various ventures and on the final page when a most unexpected twist kicked in, I was so surprised I nearly dropped the book in the bath. If you can get past the initial nastiness and violence and learn to turn a blind eye to some of the language, this is a book that’s well worth the effort, that will challenge your preconceptions about multi-cultural Britain, and give you a few good giggles along the way. Life in Hounslow’s not easy for Jas who doesn’t find it easy to fit in. He’s not got a lot going for him with his unpronounceable surname, his stammer and his slight stature all of which mark him out as a bit of a ‘gimp’. He’s trying much too hard to fit in with his gang, a little like a fourth musketeer. The leader of the gang is Hardjit (well actually it’s Harjit but he’s into martial arts and insists that everyone call him Hardjit because he’s such a big tough guy). The other two are Ravi and Amit who are both foul mouthed and constantly boasting of their improbable sexual prowess (one claims to be so manly that if he slept with a girl he’d be sure to get her pregnant with twins and they’d both be boys – showing a remarkable lack of insight into biological processes and reflecting some very traditional ideas about what makes a real man). Together this gang are hanging out, getting into fights, trying to keep their families happy and avoid getting on the wrong side of the ‘aunties’, beating up white guys for ‘disrespecting’ them and earning a few bob running a mobile phone scam. Oh and in between all that, they’ve got to re-sit their A-levels because they all failed first time round and their lives won’t be going anywhere other than baggage handling at Heathrow or working in their dads’ shops unless they can get into a good college. There’s plenty of contempt knocking around – for the ‘coconuts’ (assimilating Asians who are brown on the outside but white in the middle), for Muslims that dare to disrespect Hindu and Sikh girls (disrespect in this case means going out with, flirting with or even god-forbid, having a relationship), and of course the same applies if a Sikh or Hindu guy has the hots for a Muslim girl. Trying to balance the demands of gang and family produces some hilarious encounters such as when one of the boys has been sent to the pharmacy to get products for his mum and finds the girl he fancies on the check out. Faced with the indignity of a basket full of sanitary towels, laxatives and lipstick he chucks in a box of ‘extra-large’ condoms to impress only to get cornered by an ‘auntie’ at the check-out who’s off to blab about his purchases to his mum. There’s a supporting cast of characters that add colour to the story. Amit’s brother Arun is driving Jas crazy moaning about his forthcoming marriage to his childhood sweetheart and struggling to keep his mother happy when she’s convinced that the bride’s family aren’t showing enough respect. When Jas tells him to ‘be a man’ the consequences are shocking. There’s Mr Ashwood the history teacher who steps in to stop the boys being arrested and sets the condition that they have to spend time with a good role-model ex-pupil Sanjay. On the surface Sanjay’s the Asian-boy made good with his Cambridge degree and his big job in the city, but is there more to Sanjay and his plush apartment, Porsche, and ‘access all areas’ nightclub and restaurant scene than meets the eye? And when Jas is polished up by Sanjay to make an approach to the (Muslim) girl of his dreams, can the course of such a star-crossed love ever have any prospect for success? Oh yes, it’s a cracker. If you can fight through the language and see through the smokescreen of offensive behaviour, there’s a gem of a good read tucked inside this book. With regards the language I undoubtedly need to expand a bit. If you hate ‘text-speak’ you’ll be irritated to frustration by the way the boys talk. If you hate swearing, you’ll not get beyond the first page. Here’s the opening line of the first chapter with the expletives toned down just a bit by me. Oh boy! How do you deal with an opener like that? Especially when it’s followed by a violent assault dished out by a protagonist concerned with not getting blood on his expensive branded trainers? If you hate bad language, just give up now and scratch Londonstani off your book list. Don’t even try to take it any further – there’s so much swearing you’ll not be able to ignore it. But if you can cope with the foul mouths of the boys, you’ll probably learn a ton of new swear words in other languages. I have no idea what the translations are for these curses that are peppered around the text in Panjabi-Hindu-Urdu or whatever but I can guess that a good few are distinctly ‘anatomical’ in nature. Would the book work without the language? I’m not sure. It’s actually very clever the way Malkani has created a complex set of rules for how each boy uses his fusion language and he’s gone on the record that he drove his publishers crazy with his insistence that they comply with his strict rules on which boys could say which phrases and use words in different ways. The book is a result of a thesis Malkani worked on as an undergraduate at Cambridge. It took him many years to realise that publishing a dry academic treatise on the life of modern multi-ethnic youth and their assimilation issues was never going to get him on the shelves of WH Smiths. He now works as a journalist at the Financial Times, so which character IS Malkani – is he the gimpy Jas or Sanjay, the up-town financial success-story? Race is a key issue. When Mr Ashwood is accused by Hardjit of being racist, he’s quick to point out that it’s not him who’s judging people by their race and neither is it the boys’ parents, most of whom have spent their lives aiming to fit in and get along with their neighbours. The boys are creating their own rules and boundaries that nobody else is imposing on them. Unlike black youths with their US-influenced role models of gangsta-rappers, pimps and drive-by shooters, how do you find your identity when your role models from your own background are nice boys who go to college, work hard and become dentists, lawyers and doctors? How can you be a hard man or a ‘rudeboy’ – the term they have oddly adopted despite its black Caribbean origins – when you’ve got nobody to set the rules and the benchmarks? If you can read this with an open mind, see the humour and warmth that’s undoubtedly present, recognise the eternal issues of being an outsider and take time to examine the issues that it raises, then this book will deliver in bucket-loads. My opinions flew from one extreme to the other. In the first 50 pages the review would have been damning but by the time I made it to the end, I’d done a 180 degree turn around. And on the day I finished it, I spent hours re-examining all that had gone before in the light of the final twist. It’s clever beyond anything I had reason to expect and I can’t recommend it highly enough, although with the caveat that the violence and bad language won’t be to everyone’s taste. You have, as they say, been warned.